Boots, at first glance, may not seem like an important piece of scuba gear. They do not maintain your buoyancy, help you breathe, or help move you through the water. However, just like the mask, snorkel and fins, boots are one of the basic four pieces of equipment you should own when you first begin to dive. Why? If your boot is not fitted correctly or is not suitable for your water environment, you will be miserable. There is nothing worse than cold feet, unless it is a boot that pinches your toes throughout the dive. At Dolphin Scuba Center, we take divers all over the world, you should check out our travel section. Therefore; we know what boots will work for you, wherever you are diving! Are you diving in Indonesia with your Storm Caribe fins? Then the Lycra sock or the Storm 2mm neoprene sock if perfect for you! Are you going to be hiking along the beach on a hot afternoon? Then you should invest in the Comfo Neoprene Sandal or slip into the 2mm Beachwalker Shoe. If you are diving warm water with an open-heel fin, then the Seasoft Sunray would fit you well. 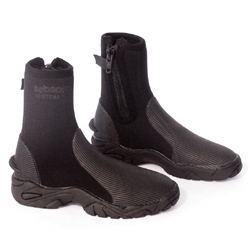 Coldwater divers would be very happy with the DeepSee 5mm High Boots, or you could upgrade to the Seasoft Ti Stealth Boot, which is the warmest, most durable titanium boot on the market. Whether you want a slip-on boot or a zipper style, Dolphin Scuba Center has a boot designed specifically for your needs.